Publication Author: Achyut. P., Bhatla, N., Kumar, U., Verma, H., Bhattacharya, S., Singh, G. & Verma, R.
Gender inequality is recognized as a fundamental barrier to the achievement of global development goals. The Sustainable Development Goals (SDGs) include a specific goal on achieving gender equality, in addition to recognizing it as a driver for achieving outcomes in other areas including health, education and economic development. Persistent and rigid societal norms restrict opportunities for women and girls, and hamper the realization of individual potential, and equitable development. Gender-based discrimination and violence remain two of the most obvious yet normalized manifestations of these norms. They reinforce patriarchal values and perpetuate inequitable gender norms across generations. 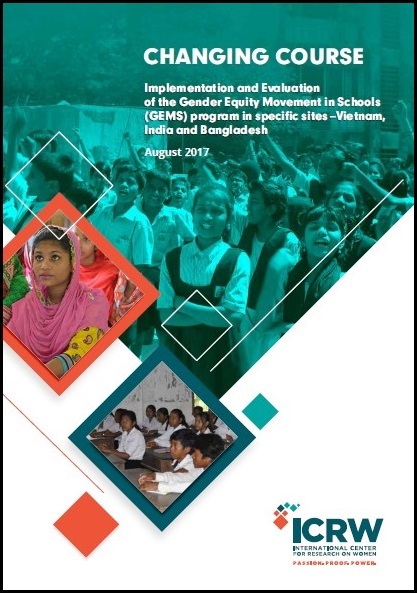 Gender Equity Movement in Schools (GEMS) is one of the few evaluated school-based programs that aims to promote gender equality, redefine masculinity and negate all forms of violence. It was first developed and tested by ICRW, the Committee of Resource Organizations for Literacy (CORO) and the Tata Institute for Social Sciences (TISS) during 2008-11 in Mumbai, India. Given encouraging results, GEMS was expanded to additional locations – Da Nang (Vietnam), Jharkhand (India) and four districts of Bangladesh. While these sites present different cultural contexts, there are remarkable similarities in terms of gender values and manifestations of inequalities in practices and beliefs. This synthesis report is based on the evaluation of GEMS. It describes the methods and findings in each of the locations, and undertakes a discussion on its implications on gender programming.